The old water tower on Broad Avenue that has become an iconic symbol for the burgeoning arts district will soon get a facelift. 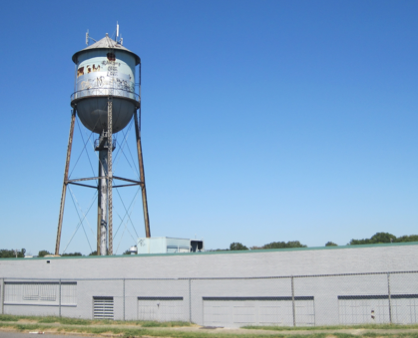 The Broad Avenue Arts District won a $350,000 grant from ArtPlace America to pay an artist to paint the tower and to transform the warehouse loading dock under the tower into a live music amphitheater. The UrbanArt Commission will launch a national search for an artist to design the tower. The winning design will be chosen using Crosstown Arts' MemFEAST concept through which patrons at a catered dinner hear proposals for art projects and vote on their favorites (Crosstown Arts held its latest annual MemFEAST event for a public art project on the V&E Greenline this past Saturday). The grant money will fund the construction of seating and a public art installation for the warehouse loading dock. The dock has been used as a live music stage for the past several Broad Avenue Art Walk events. The warehouse, which is partially inhabited by Power Telephone & Supply, will continue to house that business.